The ultimate bench for outdoor fun is found in the Amish Western Red Cedar Crossleg Outdoor Bench. This gorgeous solid wood bench is perfect for any and all outdoor activities. 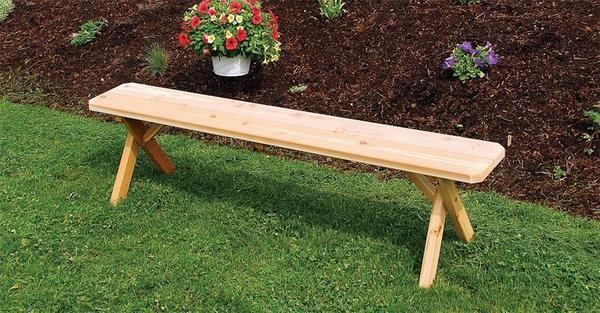 Made of strong cedar wood, this outdoor bench is ready for action! Enjoy your peaceful garden with the perfect place to perch or select an Amish Outdoor Picnic Table to create your party room outside. This traditional style outdoor bench has charming crossed bench legs and zinc plated hardware that resists rust. For party seating, outdoor dining or relaxing under the stars, this cedar outdoor furniture is Amish made and built to last.